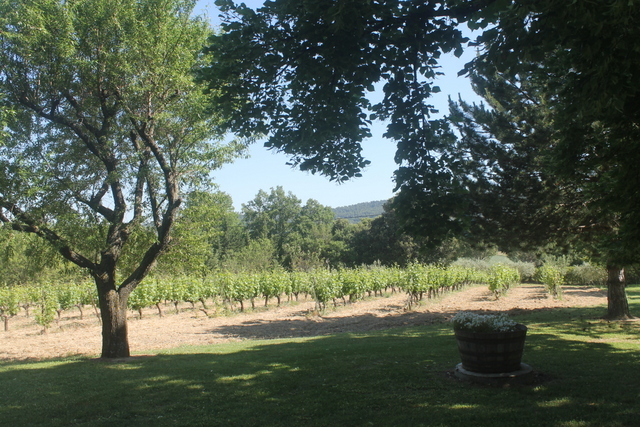 Provence wine: At the beginning of this year William Chase of Tyrrell’s crisp fame purchased French vineyard for sale, Chateau Constantine Chevalier just outside Lourmarin. However, Provençal vineyards are cripplingly expensive to run and the work is often back breaking, so just what motivates buyers to attempt to defy financial logic and make money from wine. Jamie Ivey investigates. Picture the fantasy. An old plane tree with a thick mottled trunk, rising high into the blue sky, its branches spreading a canopy of shade around the ancient stone walls of a Provençal mas. There are a few rusty boules lying discarded in the dirt and a weather-worn irregular stone table and two iron chairs. In the distance are the jagged peaks of the Alpilles and further away still the shadowy Luberon. The trickle of water into the rectangular basin and the soothing throb of cicadas are such familiar sounds you hardly notice them. However, one thing you never forget, a sight that your eyes return to again and again, is the last row of your vines breaking like a wave over the crest of a nearby hill. On the table are a pair of fluted tasting glasses and next to them an ice cold bottle of your own rosé. Each time you sip the wine you are reminded of the long night you spent sitting by the cuve watching the colour slowly turn, until reaching, in your eyes at least, that perfect pink. Your partner smiles lovingly at you and reaches across and ruffles your hair. The two of you have never been happier, all those years of hard work at a desk have been rewarded by a slice of Provençal paradise. Now picture the nightmare. The vineyard you invested five million euros in five years ago has been leaking money from day one. Within months you discovered that the books had not just been massaged, they’d been pummelled to an inch of their life. Lucrative restaurant contracts were quickly cancelled, the vineyard’s Parisian wine agent mysteriously vanished and passing trade has now halved. Your in-tray is a mess, bowed and buckling in the middle as a result of the unremitting onslaught of bureaucracy. Far from ruffling their hands lovingly through your hair, your partner spends most of his or her time moaning about the bitter mistral and the fact that all the shops and restaurants are shut till May. Meanwhile your hands are red and bloody from the unremitting labour of training the new growth of thousands of vines and your back is so painful that it’s almost impossible to sleep at night. Not a moment goes past when you don’t wonder whether your money could have been better spent on a luxury Sunseeker and a St Tropez mooring. But is this just a pipe dream? According to a local accountant only one in a 100 vineyards are actually viable businesses and Stéphane Paillard, Saint Remy’s specialist vineyard estate agent insists that’s it’s almost impossible to make money from wine in Provence. So just how do you win at the wine game? The most important thing that any prospective purchaser of a vineyard can do is take a long hard look at him/herself and ask why they are investing. For many a vineyard is the ultimate accoutrement, a possession that friends just can’t trump, the end of a long quest for personal one-upmanship which begins with the Ralph Lauren shirts at university and is followed through the decades by Rolexs, Porsches, Ferraris, mansions in the country and city centre pads. Nobody likes admitting this, so neo-vignerons as Paillard has christened the new wave of wealthy buyers tend to pay lip service to a life long interest in wine. More persuasively they speak of a determination to bring their business skills to the wine industry – for them turning a loss making vineyard around can represent the ultimate challenge. However, Paillard is more sanguine. He says that clients interested in investing in a vineyard should commit no more than 10% of their total worldwide assets. So taking the cost of a vineyard at about five million euros, buyers who can afford to sleep easy about the level of their risk will need €50 million. They should then realise that they are buying a lifestyle not a business. The vineyard should be close to shops and amenities, the accompanying property should be a pleasure to live in and mostly importantly buyers should feel in tune with the spirit of the estate. 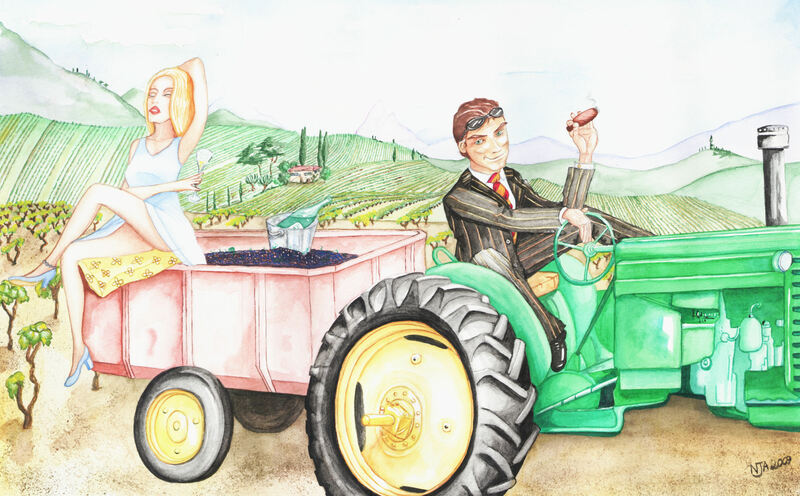 Crucially if the investment is to work a wealthy buyer needs to define success in terms of the pleasurable hours spent living amid the vines rather than the profit and loss column. For millionaires who embrace this ethos and who really don’t care about the bottom line, bespoke vineyard management companies exist that take care of everything, down to ensuring that the temperature of the fridge is perfect for preserving the Christmas truffle. For those who still insist on defining themselves by the money they make, running a vineyard can be an unrewarding struggle. No amount of spreadsheets and projections can change the reality that financial success is as improbable as finding a Provençal plumber in August. The joy in the business therefore has to come from the wine and rather like owners of expensive dive watches who actually dive, or Porsche owners who take their cars to racetracks to experience the cornering sensation, there are a minority of neo-vignerons who are fanatical about their product. For them a vineyard is not a lifestyle choice or a chance to demonstrate their peerless business skills, rather it is a necessity. They’ve smelt and tasted wine since they were young, built up expensive collections, invested in wine funds, taken part in the Bordeaux en-primeur auctions and bored hundreds with the minutiae of their knowledge at dinner parties across the world. Wine is part of their being, part of how they define themselves, and even if they end up losing everything, the whole experience will have been worth it, because being a vigneron is a noble pursuit. Not lucky enough to have Paillard’s €50 million in the bank they still gamble on the fantasy. Fortunately there are ways of being a neo-vigneron without losing too much money and there are even ways of making a profit. Probably the most sensible and low risk option is to become a négociant and acquire a house in the middle of a grape-filled valley. Rather than take the risk of buying vines at an average cost of €30,000 a hectare, négociants sit back and wait for the harvest, when they purchase grapes at a cost of roughly a thousand euros per tonne. They can then indulge their passion for wine making, imprinting their personality on the wine as it begins its journey from fermentation to bottling. There is, however, a problem – at the end of the year the wine label will read “négociant” rather than “recoltant,” and unfortunately for people who have a real passion for wine being a négociant is a bit of a cheat. The pleasure derived from drinking your own wine seems to be inversely proportional to the hardship involved in making it. To feel real satisfaction a wine maker has to reluctantly crawl from bed on bitter cold mornings to administer a much needed treatment and he has to inspect and re-inspect each row for signs of disease until his body is as bent and withered as the vines. Neo vignerons do grudgingly admit that it is possible to make money out of a Provençal vineyard. Unfortunately for the wealthy the problem is that you have to be born into a family of vignerons. 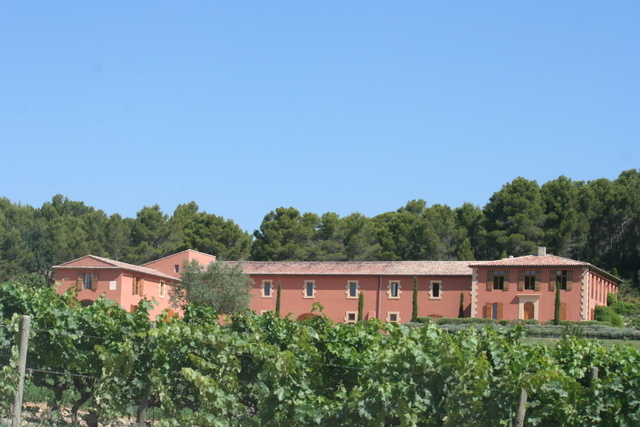 Many of the long established viticultural names of Provence are profitable businesses. They have client lists of tens of thousands of people loyal to the family’s wine. A neo vigneron can’t buy such loyalty and can’t develop such a network unless he is prepared to work in the business for a couple of decades and then hand the vineyard on to his son or daughter. To invest in an existing vineyard and make money neo-vignerons have to somehow hit on that elusive formula of price, distribution and marketing that enables them to succeed where everybody else has failed.